Over the past few weeks, we’ve been asking you to get involved in our fight to defend health care. 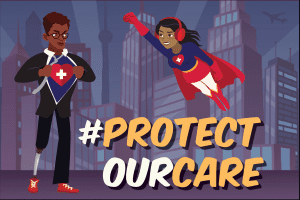 Your advocacy has been amazing – you’ve called your Members of Congress, attended town halls, and taken to social media to stand up for your right to access health care. Now, we’re pleased to announce the release of a few new tools to help you contact your Members of Congress by mail. Our templates are fillable, so you can type your message or handwrite it after you print out your postcard, whichever works for you. You can use the talking points below to help you write your message. We encourage you to snap a picture with your postcard or letter and share it on social media using the hashtag #ProtectOurCare. I’m writing to ask you to protect our health care. Access to health care is a critically important issue for all of your constituents, but especially for people with disabilities like [me/ my family member/ my friends]. I’m very concerned about policies that would cause people in our state to lose health insurance, and about cuts to Medicaid services that people with disabilities depend on to live in the community. I’m concerned about policies that encourage putting people with disabilities in separate “high-risk” insurance pools, which charge more for worse coverage. I rely on health insurance to access [mental health services / prescription medication / physical therapy / something else]. Changing the Essential Health Benefits requirement would mean that my insurance company would not have to cover the services I need. As you work on health care issues, please make sure that people with disabilities have equal health care coverage, and that no one in our state loses their health insurance or Medicaid services. As your constituent, I’m counting on you to do the right thing and protect our health care. As your constituent, I was very disappointed by your recent stance on health care. Your position hurts millions of people, including people with disabilities like [me/ my family member/ my friends]. I want to thank you for standing up for health care for people with disabilities. Remember, your Members of Congress work for you. 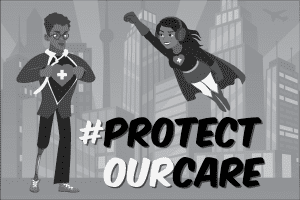 You can make a difference by letting them know how health care policy impacts your life, and reminding them that you are watching what they do next. Make sure Congress gets the message – Nothing About Us Without Us! This entry was posted in Autistic Community and Allies, News, Self Advocacy and Representation, Therapies and Health Care and tagged #protectourcare, action, Congress, health care, healthcare, house of representatives, letter writing, members of congress, postcard, protect our care, senate, template, templates. Bookmark the permalink.